How can Islamic radicalism be countered after the imprisonment of the Christian governor of Jakarta? This year’s election for the Governorship of Jakarta, the capital of Indonesia, has drawn worldwide attention and produced the country’s worst divisions since the years following the fall of the last dictator, Soeharto, in 1998. The campaign entangled the families of four former presidents, and saw demonstrations by up to half a million people, widespread smears regarding religion and ethnicity, and multiple police investigations of senior political and religious leaders. The jailed Governor is Basuki Tjahaja Purnama, universally known as ‘Ahok’, who is ethnic Chinese in a society where anti-Chinese sentiment remains strong, and Ahok is a Christian in a country that is 88 percent Muslim. However, he was energetic and efficient, resulting in a 70 percent approval rating that earlier made him the favorite to win the election. While campaigning last September, Ahok remarked that the Koranic verse al-Maidah 51, warning Muslims against taking Jews or Christians as allies, was being misused by some clerics to argue that Muslims must not vote for a Christian. Several days later, a deceptively edited video of his remarks went viral on the internet. 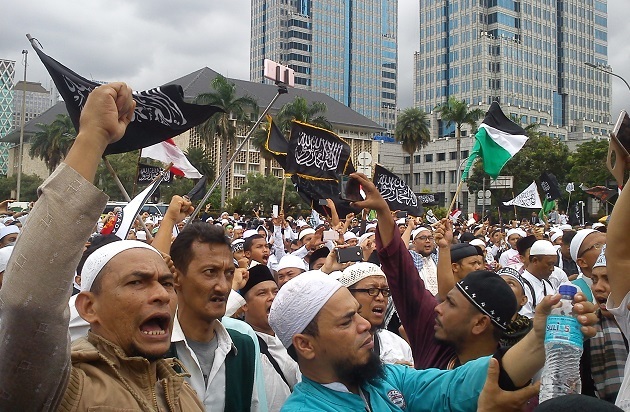 The semi-official Indonesian Ulema Council issued a fatwa accusing Ahok of blasphemy, and the radical Islamic Defenders Front (FPI), which has attacked Muslim minorities, churches, and nightclubs, called for demonstrations demanding that he be tried and imprisoned. Ahok was subsequently arrested and put on trial for blasphemy. He continued to campaign but on April 19, he lost by 58 to 42 percent. The prosecution then recommended the very light sentence of probation plus a one-year suspended jail term. However, on May 9, the five judges ignored this recommendation and sentenced Ahok to two years in prison. The following day, three of those judges were promoted by the Indonesian Supreme Court. The verdict has split the country in ways not seen in decades. There have been widespread demonstrations in support of Ahok, but many of his supporters are afraid to speak out. The police have been at odds with the military. In politically divided families, people may refuse to be in the same room with one another or attend each other's weddings. The election and trial have exposed increasing radicalization in Indonesia, especially among the young. There are several sources of this radicalization, including domestic ones, but one major factor is a well-funded Saudi network of schools, scholarships, imams, and mosques that try to replace local interpretations of Islam, which have usually encouraged democracy and peaceful relations between religions, with Saudi Wahhabism. Such Saudi influence has reappeared at several key junctures in Indonesian history. In the eighteenth century, Muhammad ibn Abd al-Wahhab, from whom the extreme ‘Wahhabi’ interpretation of Islam is named, in alliance with the Al-Saud tribe, captured the central regions of the Arabian Peninsula, including the holy cities of Mecca and Medina. This provoked reaction and argument throughout the Muslim world, including Indonesia. However, the first major conflicts arose in the early nineteenth century in the Minangkabau Highlands in West Sumatra. [i] In 1803, Wahhabis had again taken control of the holy places in Arabia. Subsequently, they influenced many Indonesian students and scholars who, when returning to Indonesia from study or the hajj, denounced the prevailing Islam in their homeland as syncretic, even pagan and apostate. Many locals, who had customs such as matrilineal succession, sharply rejected such upstart notions. This conflict eventually led to full-scale war. In 1815, the returnees from Arabia and their followers, known as Padris, killed most of the Minangkabau royal family. Their opponents sought help from the local colonial power, the Dutch, who saw both a threat and an opportunity. In 1821, the Dutch took control of the area but faced a long fight that lasted until the Padris were defeated and the war ended in 1838. Certainly, there were important factors other than rival interpretations of Islam. [ii] In a changing economy, local merchants thought that they might have greater opportunities under Padri-inspired sharia law than they had under the existing ruling families. After the Dutch intervention, there was also opposition from anti-colonialists. However, the conflict had been triggered by those who wanted to impose a more austere form of Islam on Muslims comfortable with integrating with the local cultures. A century later, in 1924, the Turkish President, Kemal Ataturk, abolished the Caliphate, and the Al-Sauds, in alliance with Wahhabis, again captured Mecca and Medina. Muslims throughout the world wondered how to respond to these changes and the newly insurgent spiritual power bloc. There were major conferences in Mecca and Cairo on the future of Islam that drew Muslim leaders worldwide and, under pressure from Wahhabis, many traditionalist scholars, including Indonesians, left what had become Saudi Arabia. - Muhammadiyah, founded in 1912, is a reformist organization that wants a purer Islam freed from cultural accretion. However, its members usually want an Islam not only reformed but also modern, something different from Wahhabism. Instead, they looked to Mohammad Abduh and other Muslim reformers for alternatives. - The traditionalist NU was founded in 1926 partly in response to the Saudi destruction of tombs and other holy places in Mecca and Medina and to rumors that they intended to destroy the Prophet’s tomb. NU’s founders saw this as a threat to true Islam as embodied in the more tolerant beliefs and practices of, especially, East Java[iii]. When I attended NU’s quinquennial Congress in 2015, I was particularly struck by the sale of reprints of the 1922 work Menolak Wahhabi (Wahhabism Rejected) by Muhammad Faqih Maskumambang, one of NU’s founders. A key center of this program is the Institute for the Study of Islam and Arabic (LIPIA), a completely Saudi-funded university in South Jakarta. LIPIA opened in 1980, with the ostensible purpose of spreading knowledge of the Arabic language—there is no Indonesian language on the campus. Tuition at LIPIA is free, and music, television and loud laughter are forbidden. Men and women are segregated. The Ministry of Religious Affairs accredited LIPIA in 2015, but has voiced concerns over whether the Institute will uphold moderate Islam and Indonesia’s state philosophy of Pancasila, which enshrines religious tolerance. After Saudi King Salman’s visit to Indonesia in March 2017, the Saudis said they wanted to open two or three more similar institutes. Alumni of Saudi universities have become influential in extremist circles. They include Habib Rizieq, the founder of the Islamic Defenders Front, and Jafar Umar Thalib, who founded the anti-Christian Laskar Jihad militia. In 1972, Saudi money helped found the Al-Mukmin school in Ngruki, Central Java, which became a hotbed for radicals, including some who took part in the 2002 Bali bombings. In the early 2000s, the terrorist group Jemaah Islamiyah also received funding from Saudi charities. Now, many of these radicals group have become self-supporting. One positive effect of Ahok’s trial and imprisonment has been that many Indonesians now realize that they have been too complacent about the extent of extremism, and this has led to a more aggressive campaign to confront Islamist radicalism. Some of this has been at the level of security and policing. Following his campaign to imprison others for blasphemy, FPI leader Rizieq Shihab has himself now been investigated for blasphemy after reports that he denigrated the Holy Trinity. He has also been questioned concerning allegations that he insulted Pancasila, Sukarno (Indonesia's revered first president), and Indonesia's currency (by claiming that new banknotes featured Communist symbols). The recent revelation of the extent of radicalization in Indonesia is important not only for Indonesians but for the rest of the world. Muslims from Indonesia are 20 times less likely to try to join ISIS than are Muslims from the US, and 50 times less likely than Muslims from the UK or other parts of Europe. It is important for the church because of the worldwide threat of radical Islamists, and the fact that over half of all the world’s Christians who live in Muslim-majority countries live in Indonesia. The country’s future is uncertain. The religious, social, and political fabric has been stretched and may be torn, especially if the tactics used in the election for Governor are repeated on a national scale in the next Presidential contest, due in 2019. Indonesia is the world's third-largest democracy and the only Muslim-majority country in the ten largest economies in the world. If it succumbs to Islamic radicalism or authoritarian rule, then the future of the Muslim world and the rest of us looks dire. Too often when outsiders think of Islam, they default to images of the Middle East and Arabs, although they are only one-fifth of the world’s Muslims. We need to pay more attention to the vast majority of Muslim-majority countries, in Asia and Africa, and their struggles with extremist ideas stemming largely from the Middle East. The Saudis have recently been arguing strenuously that they want to fight radicalism, but there have been few deeds to accompany their words. We need to push our governments to urge the Saudis to end their worldwide propagation of extremism. Fifteen years ago, you were fighting Al-Qaida. Now you, and we, are fighting ISIS. Fifteen years from now, you will be fighting some other organization. But it is the same war; it is the same ideology. You need us, and we need you. We can be friends fighting a common enemy. We need deeper friendship with such Muslims. Paul Marshall is Wilson Professor of Religious Freedom at Baylor University and Senior Fellow at the Leimena Institute, Jakarta, and the Hudson Institute. He has authored and edited more than twenty books on religious freedom. [i] For a succinct overview, see M. C. Ricklefs, A History of Modern Indonesia Since C. 1200 (Stanford: Stanford University Press, 2008), 172-175. [ii] For caution as to how much Wahhabism was a factor, see Carool Kersten, A History of Islam in Indonesia: Unity in Diversity (Edinburgh: Edinburgh University Press, 2017) 56-57. [iii] For an overview, see Jeremy Menchik, Islam and Democracy in Indonesia: Tolerance Without Liberalism (New York: Cambridge University Press, 2016) 48-51.